A reduced copy of a previous comic “Difficulty Levels” is seen, consisting of an x-y curve on which are shown along the x-axis from left to right, and increasing in height above the x-axis: a tic-tac-toe game in progress, a chess game in progress, and a stylized heart symbol, all connected by a smooth exponentially-rising curve that becomes dashed as it approaches the heart symbol. In Panel 2, a woman stands and points to a copy of the same comic. A man stands in the foreground. Woman: And given the non-numeric and discrete x values, it should have been a bar chart instead of a curve. Panel 3 shows the man standing and gesturing. Man: Well, the message is clear. Tic-tac-toe is easy, chess is harder, love is much harder. Man: And the missing labels are the point. 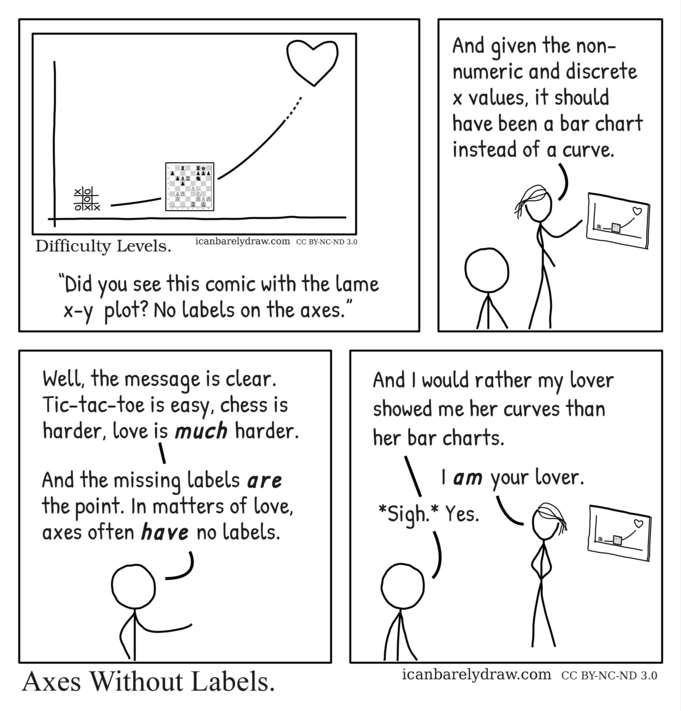 In matters of love, axes often have no labels. Panel 4 shows the man and the woman similarly situated as in panel 2. Man: And I would rather my lover showed me her curves than her bar charts. Woman: I am your lover. The man is seen slightly stooping and with his head a little lowered. You are actually defending it? Here, have some rage! “The message is clear” could also be said about the misspelled sentence “Luv iz hard”. The message might be clear, but the poor spelling distracts from the point. “And the missing labels are the point. 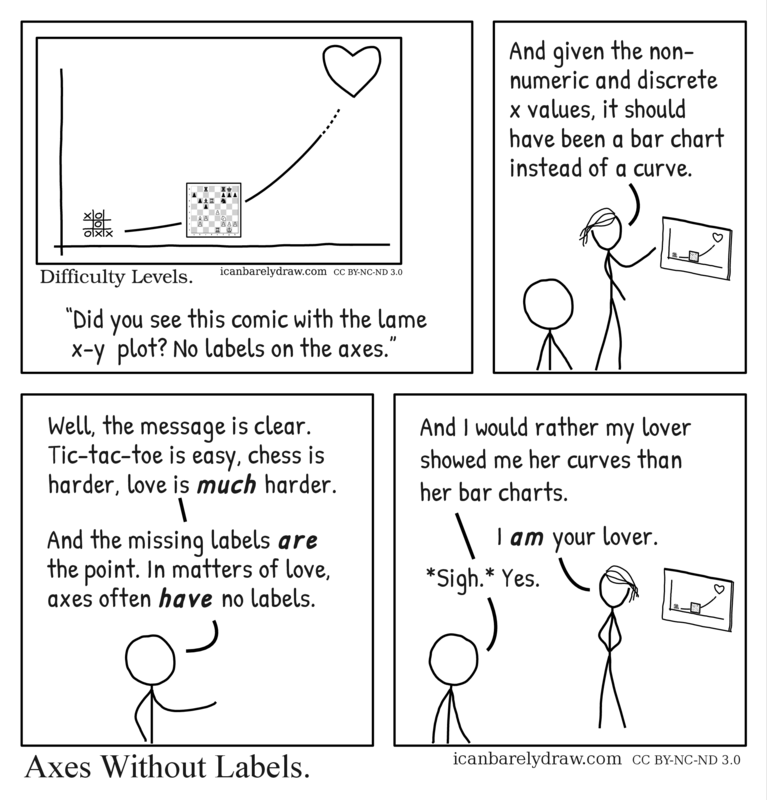 In matters of love, axes often have no labels” is another failed defense that could be applied to the misspelling above with a few alterations. Whether you are a bad speller or a bad graph-maker is not correlated with how hard love is.